Drie Fonteinen geuze at the brewery restaurant. I’ve thought of starting up a blog for a while now but was always worried I wouldn’t be able to come up with material frequently enough to make it worthwhile. Well, now I’m in a couple months into a 7 month term as a visiting research student in Mainz, Germany. I won’t be brewing while I’m here so that means I’ll need to find other brewing-related pursuits to fill this brewing void, giving me a perfect opportunity to try a blog out. As a PhD student studying the chemistry of the ocean, I tend to take a scientific approach to brewing. I grew up in Seattle and my brewing days began six or so years ago in Northern California. 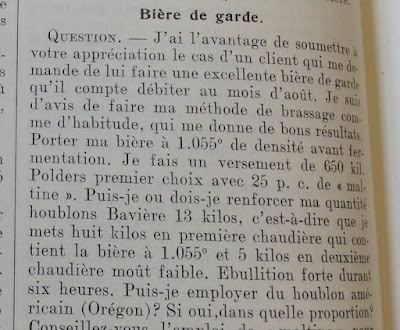 Much of my early beer and brewing education was shaped by brewers in the northwest and northern California. Following a couple trips to Belgium (and many trips to Russian River) I became hooked on Belgian brewing traditions, especially saison and lambic/g(u)euze brewing. At the start of this blog, my temporary position in Germany means that I probably won’t be contributing a whole lot of recipes, comments from brewdays, etc., but I’ll try to put in a bit of stuff from old batches that I think are noteworthy. In place of brewing I’ll be doing plenty of ‘field work’. So the beginnings of the blog will probably be more inspired by what I learn about brewing while abroad from travels, new beers and what I’m reading (with a healthy, or perhaps unhealthy, number of scientific papers) about brewing. I’d also like to take a bit of time here to acknowledge some of the folks who have been a big inspiration to me in brewing. This is certainly not an exhaustive list, and I’ll keep it to the brewers that I’ve had a chance to meet personally and talk to: Chad Yakobson at Crooked Stave in Denver Co, Clay Potter at Moon Under Water in Victoria BC, Alex Granum at Upright in Portland Or, Armand Debelder at Drie Fonteinen, and Jean Van Roy at Cantillon. All of these brewers have an inspiring enthusiasm for their craft and an eagerness to share their knowledge. At one of my favorites: the Dupont Brewery in 2011. Finally, I’d like acknowledge a couple of blogs. Although I haven’t had a chance to meet these folks, the information they share has had a huge impact in my brewing progression. First and foremost the Mad Fermentationist, whose blog has helped me improve my brewing substantially. Embrace the Funk has given me some great insight into what some of the leading commercial funky beer brewers are doing and podcasts such as The Sour Hour and Belgian Smaak have given me the opportunity to learn from countless folks in the industry and a wide range of homeberwers. Thanks for reading and I hope you enjoy the blog. Happy brewing.